I got down on my hands and knees and scrubbed the kitchen floor this weekend. I scoured the dimpled linoleum to its true color that I have never liked but which is nonetheless clean. The bleach made my hands red and caused the tiny cuts I was not aware I had to sting, but it felt really good when I was finished. I set up the hammock and the tire swing in the backyard maple, its miserly offering of sap this season all forgiven. I am raking dry grass and seed pods this afternoon toward a small fire on the old concrete slab at the back of the property that was once the floor of a carriage house. Yesterday I cooked my Easter Dinner over such a fire in cast iron pots brought home from Africa and unused since. Anticipate a post on how to bake onion beer bread in a number 3 potjie as soon as I have the chance to upload the photographs. It is another glorious day, alone with time that is all mine. The cast iron wind chime my sister gave us as a wedding present is clanging like the bell buoys of Maine in this light breeze. I see that all the ornamental trees in the neighborhood are bursting to bloom, even as the wild apples in the field beyond the garden gate have yet to flower. This is wise of the apples, for a cold rain may wash away the pollen and ruin the crop. I am walking around barefoot on ground that has only just thawed. I feel it give way beneath the pressure of my feet, yet rebound without recording the impression of my passage. I notice the ephemeral wildflowers in my shade garden are mostly above ground, now, with trillium leaves unfurling even now and blood root not far behind. There are the tips of yellow lady slippers, and jack-in-the-pulpit, and giant Solomon's seal. Welcome back, my friends. I will clear away the dross of winter to give you space to breathe. I smell the woodsmoke and the crackle of dry grass from the little fire and it reminds me of fire lines I have tended in prescribed burns. An old friend and lover who reads this blog once wrote the line "What is love but a leaf pile burning", but I think it is also a drip torch, the old tool of my trade as sometimes squad leader of an ignition crew dragging fire through the cat brier and bluestem on the Cape and Islands. Equal parts gas and diesel, and from this, well applied, the renewal of pine forest and sandplain grasslands and the rarities they contain. Love is stepping back into the black when the flame blows back, using fire to direct fire, and unaware of how the smoke permeates clothes, hair and skin until out of the fire and back in polite company. Back in the mid 1970s, when I was in 2nd and 3rd grades, my parents bought me a subscription to Time / Life Books Old West series. Once a month, a new volume would arrive with its stamped, leatherette binding and richly illustrated with historic images and artifacts. Each book in the series covered a different topic, ranging from the legendary - The Gunfighters - to the esoteric - The Expressmen - , and many are still satisfying reads today with a wonderful level of historic detail. the only survivor from Custer's 5 company battalion after the fight began in earnest was a horse, there has been plenty of room for conjecture and partisanship. The Indians had their recollections, too, though as evidence of what happened these present a number of challenges on their own, including the fact that some eye-witness testimony was given in sign language in answer to white questions. Regardless of where the blame may lie for the massacre - and there is no end of controversy over where that belongs - the traditional interpretation of what happened after Custer divided his command is that after ending Maj. Marcus Reno with three companies to charge the Indian village from the south Custer continued north along the high ground east of the river. After Reno's attack stalled and eventually withdrew in disorder back across the river, Custer and his five remaining companies were forced to occupy defensive positions in the face of overwhelming numbers of well armed Indians, and fought as a unified command practically to the last bullet. Survivors from other parts of the battlefield and from another column of soldiers that arrived in the days that followed buried the men where they fell, and some saw what looked to them like evidence of skirmish lines across a wide defensive area. Reno's men may have broken, but not Custer's, who in the best western tradition are usually said to have gone down fighting. Had the Time Life series been written a decade later, a very different story might have been told about what happened to Custer. In 1983, a range fire burned across the national monument at Little Bighorn and the park superintendent recognized an opportunity for battlefield archaeology to examine the exposed terrain for artifacts that might shed new light on the Custer fight. I have just finished reading one of the products of that research - Richard A Fox's (1993) Archaeology, History and Custer's Last Battle: The Little Bighorn Reexamined. An expansion of his Ph.D thesis based on two years of fieldwork and a fresh examination of historic accounts informed by new archaeological data and combat modeling, Fox presents an alternative explanation of the Custer fight that turns many long held assumptions on their heads. Despite the academic structure of the text, I found it absolutely fascinating. We will look into this further in a subsequent post. We've left our forest at Windrock largely to its own devices. Our family still takes a small amount of cord wood from standing dead trees or blow down, but by and large the wind and the deer and the Hemlock woolly adelgid are the primary influences on the current condition of the woods. When I walk through these woodlands, as I had occasion to do this past weekend, I carry with me the long view afforded by nearly four decades of personal connection, coupled with a naturalist's eye for the patterns and processes at work here. The trees and the stones and the thick layers of duff on the forest floor have stories to tell and hold clues to the future. Everything that grows, thrives or fades away in a terrestrial habitat or ecosystem can be understood as the result of three powerful influences: geology, climate, and disturbance. My grandparents' property in Wareham lies on a great smear of glacial overburden laid down during the last ice age. There are granite erratics like the one that gives the place its name "Windrock", and poor, well drained soils that perk well and feed groundwater to the regional Plymouth-Carver Sole Source Aquifer. The woods run down to within sight of the bluff and the bay and tree species change as the wind and the salt air determine which ones can endure and which must remain further back in the company of their taller brethren. Here you will find Atlantic white cedar and pitch pine and scrub oak and green brier, and in recent decades tangles of oriental bittersweet and Japanese honeysuckle vine, but not the white pines that shun the salt and require a bulwark against the wind. Here, too, are Doug fir and jack pine and even an English oak, for this is not a landscape devoid of human impact. While the hurricane and the ice storm and the long suppressed but still feared wildfire have great effect, the forest is neither primeval nor is the best ecological option to blithely let "nature take its course." Nature does not work in a vacuum anymore. The legacy of human land use alters everything. There are stone walls running through the woods. One of these clearly marks a property line, though the division of land likely came after the stone fence was laid and not before. This was open pasture in the 1800s, and sheep grazed the broom sedge that now clumps in the openings near the shore but not in the shade of the trees. When my Grandparents acquired the property in 1947 the forest was younger, the trees lower, and the species composition different than one finds today. There were many more pitch pines back then: early successional species that require periodic fire to germinate and reduce competition from oaks and other species. Those few that remain in the woods today have stretched to their maximum heights to find space in the canopy, and none are regenerating. The slow growing oaks - black, scarlet and white - are nowhere a significant component of the forest except in the scrub near the bluff, for they are subject to the predation of deer and are shaded out by fast growing white pine. The hemlock stands in the forest have suffered under the invasive adelgid onslaught and most of these trees are dead or dying now. A few sassafras, the odd birch near the barn, a clone or two of invasive locust and some wild holly may been seen, but the rest of the forest is single-aged white pine, and when it goes down in a big wind the blow down can be extensive. There are places in the forest where there are distinctive mounds and depressions in the soil: cups and pillows that mark where giants fell. You can tell by their orientation the direction of the wind that brought the shallow rooted trees down, and whether it was a winter nor'easter or an onshore hurricane. White pine seedlings sprout in these canopy openings. There are many deer in the woods, and heavy browse lines crop the rhododendrons. There are Cooper's hawks and foxes and eastern box turtles near the forest edge. There is a vernal pool with polliwogs in spring. There is room for 4 approval not required house lots on the road at the end of the property if we are unable to conserve it through a conservation transaction with the town and local land trust. Currently we are hung up on the limited forest management rights we wish to retain. Hopefully we will navigate this as we have other obstacles and have something to celebrate this summer. Former director of the US National Park Service Roger Kennedy had a provocative Op-Ed piece in the New York Times on Tuesday about building in areas prone to wildfires. Kennedy advocates withholding subsidies for new home construction and infrastructure in fire prone locales and the creation of a National Flame Zone Atlas detailing relative exposure to fire. "The mere existence of a National Flame Zone Atlas would drive home two truths: that wildfire is a fact of life and that the moral and political imperative before us is not just adapting to wildfire, but reducing the number of people going uninformed into danger. Fire, like flood, teaches political lessons about costly taxpayer subsidies that encourage building in danger zones. We need to stop encouraging people to build houses where houses don’t belong." The primary charge of our nation's firefighting infrastructure is to protect human life and property. Kennedy asserts that we waste more than $1 billion in fire suppression in fire prone areas where our lending practices and zoning regulations have enabled new development. While at pains to place the blame on a system that provides little incentive “to mitigate fire risks, such as requiring homeowners to use fire-resistant materials and landscaping”, and on "the federal government, which endorses indiscriminate acceptance of fire risk by subsidizing it indiscriminately", Roger Kennedy's libertarian solution comes across as an insensitive and incomplete response to a complex problem with both ecological and social dimensions. Roger Kennedy is a member of the board of directors of The Forest Guild, a progressive organization of conservation-minded foresters and allied professionals -myself included - about which I have written here and here. I've been out on the woods with him and respect his scholarship on many levels. Nonetheless, I have to say this Op-Ed piece is more a blast of hot air than a breath of fresh wind. Should those of us living in coastal communities be denied subsidized mortgages because we are more vulnerable to tropical storms and sea-level rise caused by global warming? How about those farming in frost-prone areas? Since the majority of Americans - including Kennedy - live in coastal counties and we are rapidly losing our agricultural land base in many parts of the country, there is unlikely to be political support for such tactics. Yet Kennedy endorses just such measures for those living in fire-prone areas in western states with rapidly expanding populations. These lands burn not only because their native vegetation is often fire dependent but also because of factors including past fire suppression that has allowed a massive build up of available fuel, invasive species like cheat grass that are altering natural fire regimes and spreading hot fires faster and more frequently in affected systems, and introduced pests and pathogens like bark beetle that have decimated certain forest species and increased the risk of massive wildfires. The severity and scope of wildfire today is far different from only a few decades ago, and while more people now live in affected areas, they are facing a very different level of threat under these altered conditions. It is not only those who build new homes in fire-prone areas who are at risk. Ranchers and farmers who have been on the land for generations have seen devastating wildfires destroy their herds and threaten their livelihoods from Texas to Montana. This link shows large wildfires across much of the eastern half of Texas. Is Kennedy suggesting that folks affected by these blazes also be denied assistance and told they were better off moving out of the area? It "burns" some ecologists that people are building new residences in areas that have natural fire regimes, and there are very legitimate concerns about the wisdom of this practice. People certainly need to make informed choices about where and how they build. What about those without a choice, like the poorer residents of flood prone New Orleans? People live in marginal areas for more reasons than privacy and privilege. Unless we wish to depopulate large areas of the west and southeast, we will need a suite of equitable and effective strategies to address these problems, not just the rather draconian response that Kennedy proposes. If Chrissie Hynde had lived in Delaware instead of Akron, Ohio, she could have written My City Was Gone about almost anywhere in the formerly rural Diamond State. The same goes for much of the eastern seaboard within the I-95 Richmond-to-Portland Megalopolis. Urban sprawl has a way of metastasizing with widespread impacts. It behaves as does wildfire, preheating adjacent fuels until they reach ignition, so that the flaming front of urban sprawl draws an ever expanding ring of exurban land into the furnace. Just as insidious as its urban counterpart, rural sprawl threatens small towns and communities across the American homeland. Here in the Litchfield Hills, localities closer to Fairfield and New Haven Counties are well on their way toward suburbanization as development expands up the Rtes 7 and 8 corridors. Patterns of rural sprawl can take the form of commercial development branching out from town and village centers, but it more commonly occurs as diffuse and widespread patterns of low density residential development scattered across the landscape. 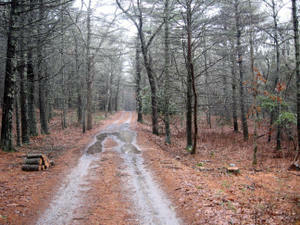 In nearby Massachusetts during the past decade, the number of forest land owners has doubled. At the same time, land in forest cover dipped from 70% to around 68%. The inescapable conclusion is that larger forest parcels have been fragmented into smaller ones. The same is true for agricultural lands, but these are more likely to convert to uses other than farming when they divide. The rural sprawl that we experience in the Litchfield Hills has generally not come in the form of high-density subdivisions. Instead, parcels of 5-50 acres in size are carved out of larger land holdings a few at a time across the landscape. With the unprecedented rise in real estate values in this area, properties that were thought to be unattractive for development only a few years ago are now highly marketable. Some of this land goes to large estates, but some is subdivided into multiple, building lots. 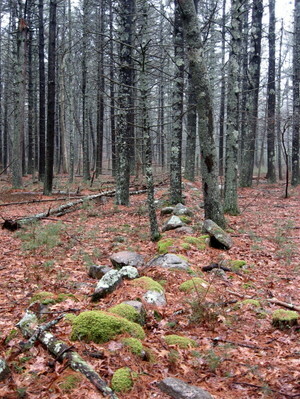 With each year, the rural character of the Litchfield Hills is steadily eroded. Land managers and ecologists are accustomed to predictive modeling, so I shall try to amplify my earlier wildfire analogy to describe the patterns of rural sprawl, and suggest ways to anticipate its manifestations in the future in the Litchfield Hills. I'm an old prescribed fire hand, used to fuel models, flamelengths, and calculating rates of spread, so at the risk of conjuring the shade of Ross Perot, "let me break it down for you." Sprawl in the Litchfield Hills behaves like a creeping ground fire. The wind is from the south - always from the urban south - but there are local and variable breezes present as well, influenced by topography. The flame front is the Interstate 84 corridor in Fairfield County, and head fires are advancing through New Milford toward Kent and on both sides of Rte 8. up the valley of the Naugatuck. There may be another, smaller conflagration to the East, but whereas Rte 8 is a conduit for southern sprawl, it is more akin to a hard firebreak discouraging the westward expansion of Hartford's bedroom communities. If that were all that were in play, then the only thing for rural planners and conservationists to do would be to lay down a scratch line in front of the advancing flames and fight a holding action against the sprawl, all the while praying that the wind speed does not increase or fires outflank the line. A frontal assault on a wildfire is a doubtful proposition in the best of circumstances, but another significant factor makes such a strategy an utterly futile response to rural sprawl. When conditions are favorable, flaming firebrands carried on the wind ahead of the wildfire will start spot fires on the landscape. This is precisely the pattern of low density rural development that one typically sees with rural sprawl. Spotting happens when atmospheric conditions and the availability of fuels combine to greatly increase the likelihood of ignition from windblown embers. Rural sprawl happens when economic, legal and social conditions in a locality experiencing growth make it more receptive to this kind of development pattern. Real estate values, commuting patterns, zoning restrictions or the lack thereof, and the degree of a community's commitment to preserving its rural character are key factors that influence how a town will develop. It should be possible, just as we model fire behavior under varying conditions, to do the same for rural sprawl and predict those areas that are most vulnerable to this phenomenon. The antidote to spot fires on the landscape, as with invasive species, is early detection and rapid response. Knowing where the fires are likely to ignite is vital for this process. The Litchfield Hills Greenprint should be able to do something similar to focus attention on those areas ahead of the flames that are most vulnerable to rural sprawl and where it will be most critical to make the conditions less receptive to it. Some of those areas may not have the most significant ecological resources, but maintaining their rural character will be critical to ensuring the viability of surrounding communities and the landscape that sustains them. We approach the wilderness in the armor of our modern lives. Those leatherstocking days when long hunters took little more into the wild than a Pennsylvania rifle, skinning knife, hunting shirt and a handful of salt are gone forever with the first-growth timber. Modern materials have certainly made backpacking a more comfortable and rewarding experience for many, and practitioners of minimum impact camping create a modest amount of disturbance. Nevertheless, most of us are lost without the crutch of our conveniences and few Americans today live anything approaching self-sufficient lives. The campgrounds of America are flooded with modern-day voortrekkers who laager their mobile homes and braai their sirloin on propane fires. A need for speed, a lust for power, drives SUVs to the supermarket and ATVs through our backcountry. Where would we be without GPS? This is not a rhetorical question: wherever we are, and in the moment. Since I feel this way, it will surprise you to learn that I packed a cellphone on my three-day hike in the Taconics. Since I needed to coordinate my rendezvous at the Quarry Hill trailhead with my darling wife, perhaps this can be justified. Fact is, one of the things that makes the forest of the Taconic Plateau so special is that it remains virtually untainted by cellular infrastructure. There are many places, on the rim and in the bowl of the Plateau, where you'll never get a signal. I know better than to rely on the false promise of cellular security: any mountain rescue I might require would be uncertain at best and a long time in coming. This has not been my best year - if you'll indulge me in a bit of severe understatement - and I'm feeling off my game. I got my first mid-life crisis at 37 and it hasn't let up for months. My retreat to the mountains was more of a pilgrimage than a vacation, and pilgrims, you will note, seek both spiritual enlightenment and personal reaffirmation. I needed the journey to re-engage my senses, to confirm my confidence in my worth and abilities. And so the cellphone was a grudging concession to aging bones and uncertain steps. I vowed I'd leave it in the bottom of my pack. I reached Lion's Head around noon on the first day and walked toward the overlook facing south-southeast. A clump of pitch pines perches near its summit, a modest fringe of craggy trees unremarked by most hikers intent on the prospect of what lies below. Yet before we peer out over Washining and Washinee Lakes, Canaan Mt. and distant Mohawk with its downhill scars and drivable summit, pause for a moment to consider this remarkably adaptive tree and how it comes to persist here in the harsh, acidic ridgetops, and also in another, quite different habitat: the sandy outwash and coastal plains of the Albany Pine Bush, Cape Cod, Long Island and New Jersey. Pitch pines have been with us in the Northeast for over 10,000 years. When the last, great ice sheet withdrew, melting faster than it could advance, it left a landscape scraped to its bedrock bones. The first vegetation to recolonize this greatly disturbed landscape were tundra species, now represented in Northern New England by alpine remnants atop our >4,000 footers. The first tree species to arrive were pines- pitch pine and jack pine- and in the absence of competition they were everywhere. We had pitch pines in fens and pitch pines on sweet soils. We had pitch pines in optimal habitat and pitch pines in marginal settings. Tim Flannery's The Eternal Frontier, his extraordinary ecological and social survey of North American history from the death of the dinosaurs to the present day, notes that for a million years after the impact event that blasted the flora and fauna of the Northern Hemisphere out of all recognition, the fossil plant record shows one dominant species. This plant evolved in riverine systems, with long tapered leaves designed to disperse the force of floodwater, but it turns up on mountaintops, in deserts, on cold, northern slopes. It made use of all environmental niches because it had survived the asteroid impact and fires and floods that followed in its preferred environment and had no competition to check its spread for the next few million years thereafter. Once other vegetation recolonized the landscape, it was pushed aside from all but its specialized niche and was not longer "invasive". 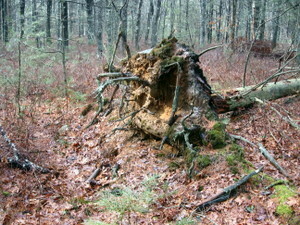 The same thing occurred following the last glacial period with pitchpines. The tree species that followed the pitchpines, slower to disperse but more persistent once they arrived, were better adapted to many of the available habitats and were able to out-compete the pitch pine in all but the most extremely harsh environments. The acidic ridgetops of the Taconics are one such place, and here one finds small patch communities of pitchpine, scrub oak and huckleberry in place of the denser forest types downslope. There are even examples of the rare dwarf form that pitchpine assumes on Mt. Race and Mt. Everett, where the trees seldom reach a meter in height yet persist without being shaded out by oaks and red maples. Often pitchpines require periodic groundfires to remain viable, as the flames both suppress competing vegetation and allow their sticky, serotinous cones to open and germinate. Coastal pine barrens and some ridgetop pitch pines have serotinous cones, but those on Mt. Everett and perhaps other sites in the Taconics are not thought to be fire dependent. Their cones are apparently not serotinous and their competition has thus far not managed to displace them from these ridgetops. From a management perspective, then, pitch-pine/scrub oak ridgetops present a challenge to conservationists. Some may be fire dependent at some interval and intensity, while others may be fire sensitive and unable to regenerate after fire. Although I am aware of no research that has taken advantage of the opportunity to study the effects of the recent Mt. Everett wildfire, in 2002 it burned across a pitchpine community on the east flank of the mountain and over the course of the next six weeks smoldered through a total of just 18 acres before it was finally extinguished by heavy rains. Just 18 acres! It took the resources of dozens of fire companies just to get to the fire and consumed many local fire budgets as well as timber. It burned so hot that there are fire scorch marks 20 feet up the trunks of large trees, and today there is a brown scar on the hillside that marks the fire's passage. It was such a stubborn fire because it went underground. It burned in the deep duff layer that had accumulated in this forest over more than a century, in places to a depth of more than a foot, and even burned through tree roots. There is so much available fuel, not because we haven't done more logging, but because natural fire has been long absent and is vigorous suppressed when it appears. Although not as fire dependent as our western forests, perhaps 3/4 of the eastern woodland communities rely on fire to some degree to persist over time. Oaks may prefer low intensity ground fires every half century or so to aid in regeneration. Fire dependent pitch pine communities need to burn at least every 40 years to allow resprouts as well as regeneration from cones, and often at much more frequent intervals. Some estimates by fire practitioners in Massachusetts indicate that the Commonwealth easily has 50,000 acres of fire dependent communities that should be actively managed each year with fire. In a good year, the Nature Conservancy and its partners in Massachusetts managed to burn near 1,000 acres. Former TNC Massachusetts Chapter Burn Boss Joel Carlson is now Chief Fire Warden for the State, so perhaps we can look forward to more prescribed fire in the future. Not all wildfire will have these positive benefits. The fire ecology of our woodlands has been dramatically altered along with species composition and structure by past and current human land use and the impacts of chestnut blight and other pathogens. There was a great wildfire in 1930 that began around Boston Corners, NY and burned across Bear Mountain in CT before it was checked in Sages Ravine on the MA/CT line. Old timers recall the days where the fire raged on the Mountain, and truckloads of unemployed men from Hudson were paid by the day to fight the fire with Indian packs and shovels through thick mountain laurel and the sproutlands that covered much of the formerly logged mountainside. I had been told that the summit of Bear Mt. was quite different in species composition from other ridgetops as a result of this old wildfire, but found as I gained the massive cairn at the peak that there were plenty of pitchpines and other typical species. Still, there must have been significant changes in natural community response after such an intense fire. We'll pick up the trail at the summit of Bear Mt. in a subsequent posting.